Author’s Note: Master Zhao Ming Wang (b. 1966) is a friend of mine who teaches Qianfeng Daoism in Beijing, in the People’s Republic of China (PRC). Modern China is a Socialist country, and in a number of his Chinese-language blog posts, Zhao Ming Wang mentions the Communist Party of China (CPC) with gratitude and respect. As a Marxist-Leninist (Maoist) I agree with this assessment and fully endorse Master Zhao’s attitude and opinion. Of course, people are free to disagree and leave our Qianfeng Daoist websites and make no use of the free information posted there. Even if this is the case, however, this does not change material reality. Spiritual paths within China have undergone dramatic evolution since 1949 whilst retaining their core values. Master Xu Yun (1840-1959) ensured that Chinese Buddhism was disciplined and able to support the Socialism of New China, whilst the Daoists and Confucianists soon followed. Some people still choose a life of isolation sat in the hills of China, and their choices are respected by the Chinese State (contrary to US disinformation campaigns and imperialist racist attitudes). Every so often I receive emails or social media messages misrepresenting Communism and Chinese culture in equal measure. Today it was a character calling himself ‘Lu Yang’ – a Westerner pretending to be ‘Chinese’ and hiding behind a false name. His view of Daoism was entirely Eurocentric and his understanding reduced Daoist philosophy to that of Christian theology. Such misled people abound in the West, but we must be careful not to paint all Westerners with the same brush. Those who loudly express their ignorance (a very ‘unDaoist’ habit), tend to obscure from sight those Westerners who quietly study correctly, moderate their behaviour and control their minds (the essence of acquiring ‘virtue’). In the meantime, it is clear that the real history of Zhao Bichen demonstrates that despite his progressive and modern attitudes, he did not suffer fools. During times of great changes in China, Zhao Bichen became equal to challenge and single-handedly modernised Daoism and managed to distinguish it from the morass of superstition and false notions from within which it had fallen. There is no doubt in my mind that people can be good and productive citizens without recourse to religious indoctrination or the accepting of rather stupid or silly superstitions. I am also aware that not every individual that professes a religious belief is an idiot or unquestionably accepts the historical and existential behaviour of politicised churches. The problem in the West is that religion is still taught within schools as if its theology is a material science, rather than an ethereal philosophy (among many philosophies). This automatically brings religion into conflict with material science, as theology (and church dogma) present a ready-made and unquestioned view of reality that in its purest and most intolerant form rejects the experimental basis of scientific research and theoretical progression. Although the West has undoubtedly secularised (and the Constitution of the United States separates Church from State just as the Constitution of the Soviet Union did), the US government guarantees the unquestioned right to a religious belief (just as the USSR did), and rarely takes any action when those theological beliefs clash with the reality of the material universe (unlike the USSR which emphasised secular education to be the norm, and religious beliefs to be a private matter that should not interfere in the running or development of society). Indeed, the US Constitution with regards to religion, rejects the British tradition of ‘State Religion’ which exists in the UK even today (dominated as it is by the Church of England which was invented by Henry the VIII in defiance to the power of the Pope in Rome). School children in the UK, even as young as 5 years old, receive a basic introduction to science, whilst being told gods and angels are ‘real’ (at times such as Easter and Xmas, etc). This indoctrination continues until the children (or parents) can choose to abandon religious education (which today receives a multicultural edge, introducing the basic teachings of Judaism, Islam, Hinduism and perhaps Buddhism). Nowhere on the curriculum of any Western school (as far as I know) is ‘atheism’ or ‘non-theism’ taught as a legitimate philosophical choice. This means that there is a contrived dichotomy within the Western mind that engages the harsh realities of logos but which is also drawn to the comfort and apparent sweetness of mythos. Although science (logos) is demonstratively superior in the direct and obvious benefit of humanity, the religions portray their theology (in the case of the Judeo-Christian tradition) as an equally valid alternative to science. This is despite the fact ‘faith’ – regardless of how comforting it can be – never invented a steam-engine or developed antibiotics. Did religion exist within the USSR? The answer is ‘yes’. It existed in two broad ways: the first was the religious communities that practised the Judeo-Christian religions and Buddhism (with ‘non-theistic’ Buddhism not being perceived as a ‘religion’ as such, due to the high regard it was held in by Marx and Engels), and the academic study of religious teachings and religious cultures at university level. There were atheistic Soviet professors whose academic speciality was the history and beliefs of the various religions. This allowed the Soviet State to tailor secular educational programmes in a manner best suited to the religious community being engaged. Many religious communities were illiterate and the simple act of teaching these people to read and write changed the nature of those communities (and psychologically moved the populace away from believing in the worst kinds of superstition). Religious communities received State help for their everyday lives, but the religions they believed in were not allowed to hold any office of State power. If the purpose of a religion is to ‘free’ an individual from a particular type of suffering (imagined or otherwise), then what would be the point of holding political office? (Unless, of course, somekind of hidden agenda was in effect). This is how the USSR and USA differed in the protecting of religious rights. Religion in the West supports capitalism (unless otherwise stated), whilst religion in the USSR did not have to support Socialism but was expected not to interfere with the progressive building of society. In China things are a little different in some ways, but similar in others. Like the USSR and USA, the Constitution of China separates Church from State, or religious control from secular control. Furthermore, with the reconstruction of ‘New’ China beginning in 1949, all religions in China are obliged to support the Socialist development of China’s society on every front. In return for this support, every religion receives generous material support from the government. Of course, Christianity is not (and never has been) popular in China, but the spiritual paths of Confucianism, Buddhism and Daoism, given their ‘other worldly’ orientations, are by default anti-greed and therefore easily able to support Socialism due to its anti-capitalist ethos. It is only in the capitalist (and racist) West that certain renegade lineages of Chinese religious thought openly support European capitalism, imperialism and exploitation. This is often a simple process of Chinese systems of thought being deliberately misrepresented through Christianised interpretations that possess no meaning within the Chinese cultural milieu. The point is that an objective study of religion (regardless of cultural origin) reveals that religious teachings have been changed throughout the eons by kings and emperors, holy men and women, religious authorities and by popular demand. The assumption found within many religions that their ‘unique’ teachings are ancient and have remained ‘unchanged’ (hence the strong ‘conservative’ nature of many religions) is demonstratively ‘wrong’ and does not fit the known historical facts. Early Christianity in Rome changed dramatically to accommodate the Roman State – and then embarked upon a regionwide persecution of all those early Christian schools that remained indifferent to legal recognition and political power. After accepting all the non-Christian traditions into its Christian practises, Roman Christianity assumed the attitude that it – and it alone – was the only ‘true’ manifestation of god’s teachings upon Earth. After massacring and persecuting all the older traditional Christian sects, the Roman Catholicism then created the false propaganda (still believed today) that it was non-Christian (i.e. ‘pagan’ and ‘heathen’) groups that perpetuated this pogrom (thus ascribing a persecution complex to their belief system). This belief augmented the already existing sense of ‘specialness’ retained from their Jewish roots. What of China? Emperors, kings, presidents, warlords and general secretaries have all come and gone throughout China’s long history, and each has had his or her viewpoint (and preference) regarding religion. Many have been indifferent or persecutors of religion, whilst others have preferred one over the others (to varying degrees). Although many Westerners in the modern West incorrectly interpret the Chinese religions of Confucianism, Buddhism and Daoism through a Judeo-Christian interpretive filter (no matter how subtle), the fact remains that these three philosophical schools do not rely upon a central god figure and have no historical association with Judeo-Christian theology. This reality does not stop the belief systems of one-fifth of humanity being habitually (and deliberately) misrepresented in the West. Much of this is linked to economic exploitation and the taking advantage of humanity’s will to learn, to Eurocentric racism and an anti-Socialist attitude (particularly in the US). This means that many Westerners from comfortable backgrounds may ‘mimic’ Chinese culture and ascribe to themselves Chinese-sounding names and assuming (incorrectly) that the Christian ‘heaven’ equates to the ‘divine-sky’ (it does not), or that the principle of Buddhist karma equates to Daoist concepts of ‘fate’, or that both are somehow indicative of ‘god’s will’ (they are not). 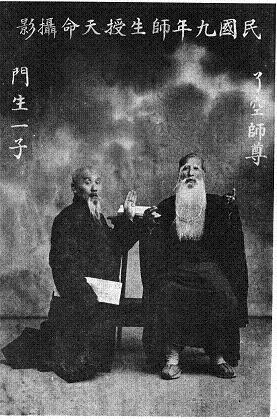 Although the great Daoist innovator Zhao Bichen (1860-1942) trained in many different Daoist schools (under as many as 36 different masters), he only accepted transmission from two Ch’an Buddhist monks in 1920 (during the Nationalist Era), but he had been training with these two masters since meeting them in 1895 (during the Qing Dynasty). He mastered the ‘Dragon Gate’ (Longmen) Branch of the ‘Complete Reality’ (Quanzhen) School, and he acquired this knowledge through training in the entire teaching of the Wu Liu School (which is considered the theoretical foundation of the Qianfeng School which Zhao Bichen founded in 1920). However, despite being extensively trained in traditional Chinese martial arts and Daoist teachings, Zhao Bichen also possessed an enquiring mind that was fascinated with Western modernity. This inspired him to make a comparative study of Western anatomy and physiology, and to integrate many Western concepts and terms (found within modern biology) into his Qianfeng instructional texts. This simple act of progression achieved two things: the first was that Daoist methodology (whilst retaining its traditional basis) was immediately modernised in China, and secondly this usage of Western terms immediately opened the door for Western students to access traditional Chinese Daoist thought free from the usual hurdles of unfamiliar religious concepts and terms. Zhao Bichen – using a logical mindset – managed to a) preserve tradition, b) make that tradition relevant to a modern China, and c) make that tradition of interest to Westerners. These developments were particularly important as Zhao Bichen also broke with the Daoist tradition of a master only having one or two disciples per generation. From 1920 everyone was welcome to train in the Qianfeng School – a practice maintained within modern China by Zhao Ming Wang (the great grandson of Zhao Bichen). As a lineage within the philosophical branch of Daoist Schools, Qianfeng Daoism is viewed as a science of both body and mind development that does not rely upon ‘faith’ or belief in gods and spirits to be effective. This is how Zhao Bichen rescued humanity from the fog of religion.